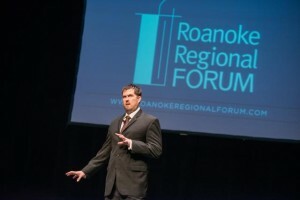 The Roanoke Regional Forum is a series that encourages dialogue among business, civic, and community leaders by attracting notable speakers to the Roanoke Region for the purpose of engaging leaders, raising awareness about relevant issues, and the health of our region’s economy. The Roanoke Regional Forum is an educational organization, striving to engage, inspire, and enlighten. Our mission is to bring leaders from the world stage to our stage in Southwest Virginia. We are also a networking organization. We bring unique opportunities to discuss matters of importance with many of the leading business people and politicians in the region. The time before our programs has been called the best networking time in Roanoke. While a limited number of tickets are normally available for individual programs through the generosity of our sponsors, reservations are required. You may reserve your ticket at the “Get Tickets” tab.